After years of looking for a delightful scent to be my signature apartment aroma I finally found Voluspa, Baltic Amber candles. Appropriate for a couple of reasons, subtlety is one, the Latvia connection is another. Anyway, I love this smell. Now here's the thing, I'm recently unemployed (gasp) and as a result am using said candle sparingly, because god knows when I'll be able to afford another one. I haven't burned it in at least 2 weeks. So tonight on the rare occasion that I find myself at home I thought it may be nice to pong up the place. I lit the thing with my last match at about 7:45pm. I blew out the candle at about 9pm and at approximately 9:30pm I got a whiff of a dreadful burning plastic smell. I followed my bionic nose into the kitchen and zeroed in on my dishwasher. This was definitely where the horrific stench was coming from. I stopped the cycle and gingerly opened the door. Heat poured out and what may have been a smoke/steam combination followed. I pulled out the racks individually and wasn't able to identify anything immediately wrong, apart from the asphyxiating smell. I called my friend Lemonade and had a little panic attack. She said “Congratulations you've been the proud owner of a dishwasher for a whole month!” I'm able to identify sarcasm pretty quickly and this comment was laced generously with it. I mean she's right. I've lived in my new apartment for just over a month now and I've almost lit my kitchen on fire already. It took a couple of calls back and forth with Lemonade to calm me down. I finally pulled out the bottom shelf of the dishwasher and stuck my head right in. I noticed something gold and shiny stuck under the bottom spray arm. 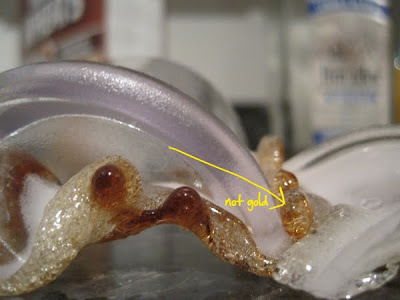 Then oddly enough, I discovered it wasn't gold, as apparently my dishwasher isn't an Alchemist, it was charred bubbling plastic. I quickly realized the stopper for my blender had fallen out of the rack and landed on the heating element in the bottom of my Whirlpool. It had melted itself around the element and from what I could tell was still smouldering. I dragged my fan into the kitchen and have begun the process of airing out the second apartment I've tried to incinerate in the past 3 months. Ultimately I'd like to burn my Baltic Amber candle to mask the stink, but I already burned it for an hour today, plus I'm out of matches. I'm also pissed off because that hour of candle burning is all but wasted as the reek of plastic is beyond overwhelming. Plus to add insult to aromatic injury, I guess no milkshakes for breakfast tomorrow morning.